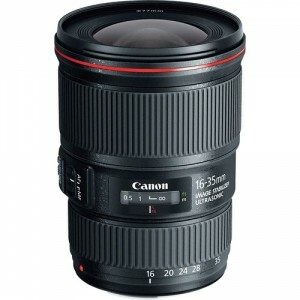 The Canon EF 16-35mm f/4L IS USM lens offers a full-frame camera owner an ultrawide zoom lens with a constant f/4 aperture. This lens also features image stabilization and Canon’s legendary “L” series build and image quality. It is generally very well regarded by users while offering a package that is only slightly bigger than the more budget friendly Canon EF 17-40mm f/4L . The 16-35mm f/4L is designed for full frame bodies, but can be used on APS-C bodies as well. When mounted on APS-C bodies it will yield an effective 26-56mm focal length on a full frame camera. The Canon EF 16-35mm f/4L IS USM is renown for it’s almost legendary image quality. This is one of the sharpest ultrawide zoom lenses currently available. It yields sharp and contrasty images at pretty much all focal lengths and apertures. If you own a Canon Full Frame digital SLR camera and are looking for an ultrawide zoom lens, then this is the lens you should look at. While it does cost more than the 17-40mm f/4L, it offers a lot more value as well. Having Image stabilization also helps when the light levels drop. The Canon EF 16-35mm f/4L IS USM is better built with full weather sealing that does not require a front filter to complete the sealing. It is also sharper than the 17-40mm. I personally prefer this lens over the much more expensive 16-35mm f/2.8. It uses smaller filters (77mm vs 82mm on the f/2.8 version) costs about half, and is sharper than the f/2.8 lens. based on 542 user reviews online.